Oranges and lemons fresh from the tree! We are a three-generation family, living in the UK. Villa Verde offers us all a quick escape from an unbearable winter, a spontaneous weekend away with friends, a spring and autumn hiking, playing golf or sightseeing, or a summer relaxing in the sun (or shade!). We bought Villa Verde as a family holiday home, to suit all of us, from children to 90-year-olds. We wanted somewhere away from the crowds on the coast but within easy reach of top beaches, sightseeing attractions, golf, mountain hiking, shopping and culture. Not needing to drive home after dinner was a must! Benahavis suited us as it can be used year-round for different purposes: Christmas for all the unusual Benahavis traditional customs, spring and autumn for golf and hiking, and summer for a spot of sunbathing. Bathroom 1 and 2 are downstairs. Bathroom 3 is upstairs. Hot and cold air conditioning in living room and all bedrooms. Two dining areas, one in kitchen (seats 6) and one outside kitchen on balcony (seats 8). Our agents can food shop for you, prior to your arrival, for a small fee. The property was everything we expected and Benahavis is a great location. We went as a family of three generations the youngest only 10 months, we were warned that the villa was not child friendly but we found it quite easy to cope with the small children. The pool was great and the hot tub was an added bonus as it had a bubble feature which the children loved. As a previous review had said there are various places to sit either in the shade or the sun, the two balconies made this possible also giving areas to escape the grandchildren when we had had our share of child watching! Air con meant all got good nights sleep. 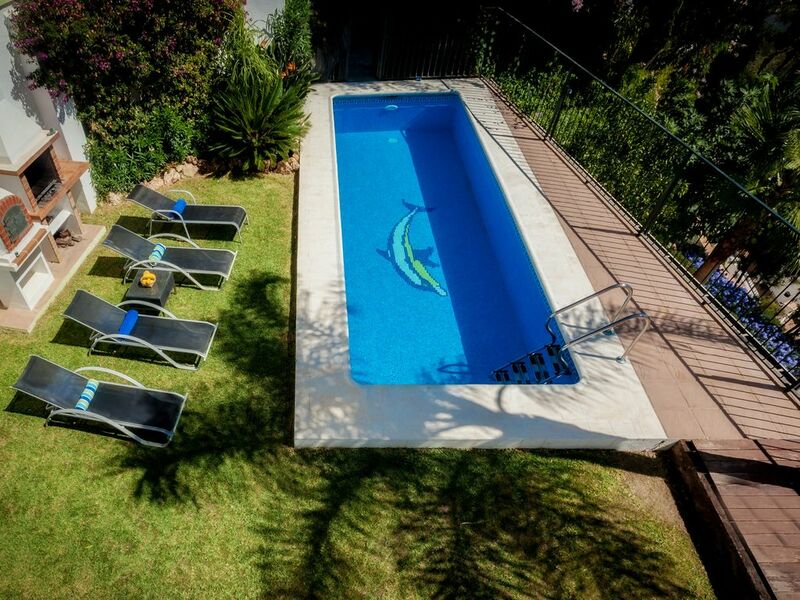 The villa is extremely conveniently located for access into Benahavis centre although it does involve an uphill section which was taken slowly in the heat of the sun. Being in the heart of the village did not mean that privacy was compromised we were not overlooked by any other villa's outdoor living area and felt quite private. Safe parking for three cars all under cover behind electric doors was excellent. We had fantastic communication prior to our visit and when we arrived were allowed in early and also allowed to leave late on our last day as the villa had no rental the days before and after ours. A great big thanks for that and to the agent Paul who met us on time both arriving and departing all this made our holiday rental completely stress free. Overall an extremely pleasant experience and I would highly recommend Villa Verde. Thank you so much for taking the time to give our property such a wonderful and comprehensive review, Lesley. We hope that you and your family will visit us again, soon. Fantastic family property with loads of space for all to enjoy. Stayed at Villa Verde from the 6th to 16th August 2017 with a family of 8 adults and 1 child. The villa was absolutely fantastic with 5 great bedrooms with 3 bathrooms along with a lovely kitchen and lounge area. The outside space is great with 2 lovely balconies one for eating and another at the front of the villa for chilling out with a glass of wine. Loads of space around the pool with sun loungers another seating area along with a jacuzzi. In my opinion the pictures of the pool area don't do the villa justice. This Villa is great and you won't be disappointed. Benahavis itself is a lovely resort with plenty of restaurants and bars to choose from. I could start to recommend some but to be honest they are all great. We had lunch or dinner out everyday during our stay and never went to the same restaurant twice. We still have plenty on the list for our next visit. Lovely people and a really nice atmosphere everywhere. We hired 2 cars from Marbesol and collected them from the airport. Easy process with the rep waiting for us, transfer to the cars and reasonably priced. I would recommend a car staying in Benhavis so you can explore the surrounding area. Ronda is beautiful. Fresh bread and cheese from the village shop was a great way to start the day. If you just wanted to chill out at the villa all the restaurants and bars are just 5 minutes stroll away, so no need to drive at night. This is the first review I have completed and don't generally bother but wanted to share our experience of Benhavis and Villa Verde. We will most certainly be back and this resort and the surrounding area is the only place I have visited in my 47 years where I would consider buying a property. Thanks to Alison the villa owner and Andi and Paul whilst we where there. All very efficient and clear communications from start to finish. Thanks to you all and I'm sure we will see you again. Thank you for your lovely review, Jason, and for taking the time to give future renters so much useful information. We look forward to welcoming you back to Villa Verde soon! We had a wonderful week at this villa. Unusually, it is even better upon arrival than it looks in the photos. We have 4 children, aged between 4 and 17 and everyone loved it. There are so many different spaces to use at various times of day whether you are seeking sun or shade. The combination of both pool and hot tub was a real luxury, but one we really appreciated and both were used a lot. The villa is beautifully furnished and the kitchen well equipped. The wonderful village of Benahavis is the perfect distance away - close enough that it's just a few minutes stroll (albeit an inevitably hilly one!) but far enough away that it's still very peaceful. Having been to different properties in the village, I was worried this would be overlooked but actually it felt very private. The owner was very swift to respond and helpful in advance of our stay, and the on-site agents were really friendly and flexible (which again I find unusual). We'd thoroughly recommend this villa and indeed, my children are already asking when we can go back! We are so pleased that you enjoyed your holiday, Rebecca. Thank you for your complimentary - and comprehensive - review. We look forward to welcoming you and your family back to Villa Verde soon! Benahavis is a perfect holiday centre, within a few minutes' drive of first class beaches and sightseeing destinations during the day - but also within a few minutes' walk of top restaurants and convivial bars in the evening, without the necessity to drive back to our holiday villa. Please note that guests must check out by 10 am on departure day and new guests may not arrive before 4pm on arrival day. Exceptions may be made by prior arrangement, dependent upon other bookings.